Robert Kennedy paled in comparison to Jack and Joseph Kennedy, at least in Joe Kennedy’s eyes. Jack and Joseph were seen as the two promising sons of Joe and the ones that would make the difference. Robert was mostly cited as a Momma’s boy and grew up mainly around his mother, Rose, blocking him from his fathers scorn and helping compensate for the lack of attention that he got from his father. When World War 2 came around, Jack and Joseph went to fight, whilst Robert was forbidden from doing so. He eventually was allowed to, but flunked his flying test. Then by the time he got on a boat to be shipped out, the War had ended. Not to mention, Joseph Kennedy, his brother, was killed when his plane exploded on a dangerous mission. So, he missed out on helping with the War effort and furthering gaining credibility with his dad. He later did when he joined the Harvard football team and once played against Yale with a broken leg. Nonetheless, his Dad ended up getting him a job alongside the crazy “communists are everywhere” McCarthy. Robert quickly left that ship before it sunk. Robert soon squared off against his nemesis Jimmy Hoffa (said to be tied to gangsters). Robert soon left that to aide in his brother’s campaign for President. He was the cornerstone of the campaign. And soon became Attorny General of his brother Jack Kennedy’s administration. He was the moral compass during the Cuban Missle Crisis that possibily saved millions of lives. Robert soon became committed to the Civil Rights movement in the early 60s. He helped James Meredith get into the University of Mississippi with the aide of the National Guard. He helped bring an end to the Jim Crow Laws with the Civil Rights Act of 1964. After his brother’s assassination, he went to South Africa at a time when politicians didn’t dare mess with South African politics. He receieved a 22 minuted standing ovation when he came to the 1964 Democratic National Convention. Quite the deal. He eventually became Senator of New York (I believe) overwhelmingly. Soon though, everyone was pushing for Robert to get into running for the the White House, including his wife. She felt it was his moral obligation to run for president. So he did. Kennedy stood on a ticket of racial and economic justice, non-aggression in foreign policy, decentralization of power and social improvement. A crucial element to his campaign was an engagement with the youth; whom he identified as being the future of a reinvigorated American society based on partnership and equality. After the King was assassinated in Memphis, Robert Kennedy gave an impromptu speech in Indianapolis trying to calm the people there. One of the best speeches I’ve heard considering it was impromptu. There were 60 cities across the US that broke out in riots…except for Indianapolis. Give it a listen below; it still gives me chills. Kennedy went to the poor areas of Mississippi to meet the people, shaking their hands, asking them questions. He deeply concerned himself with the poor and equal rights for the blacks. He thought we as a nation, could be more. Sadly, he was assassinated in California by Sirhan Sirhan before his dreams could be realized. I love this quote: “There are those who look at things the way they are, and ask why… I dream of things that never were and ask why not.” To many, after Jack’s assassination and the King’s assassination, Robert Kennedy was seen as the last great hope for America in time of war and civil rights and all the crazy 60s stuff that was going on. But he was killed. So what could have been? 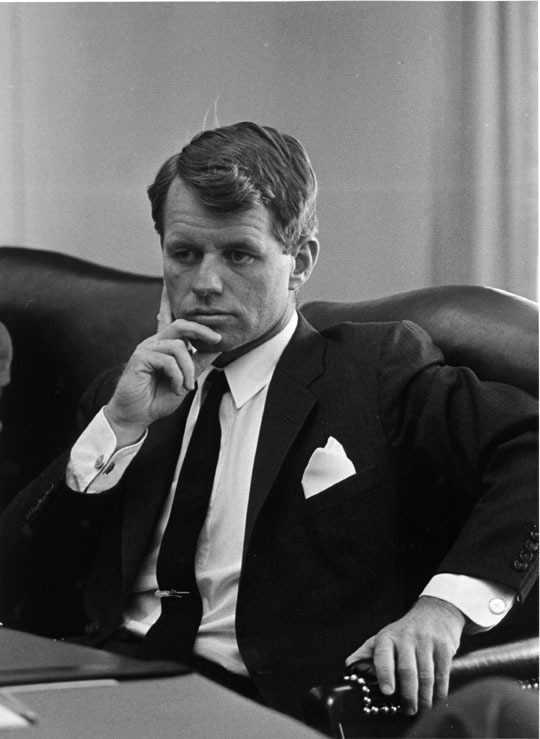 What could have been had Robert Francis Kennedy made it into office and been the President of the United States? I felt he would have drastically changed the course of American history…for the better. Peace would have ensued, I believe. The hope restored. And equality for all would have come quicker. And not just for America, but for the world. Robert Kennedy: Many Sides – A biography on Robert Kennedy done on A&E. It was short, but well done, I felt.